Large A4 Printable Alphabet in colour or black and white. 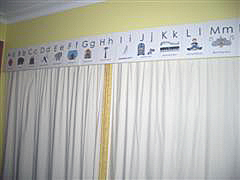 The Alphabet Frieze is a large A4 size. It includes capital and lowercase letters with clear graphics that begin with the letter sounds. Great for a classroom or home display. The Alphabet Phonograms Flashcards include a set of single & multiple phonograms including Assessment/Checklist for recording progress. One of my favourite alphabet printables are the Alphabet Wheels – These are so cool! This set consists of 5 easy to make Alphabet Wheels that cover the initial letters. 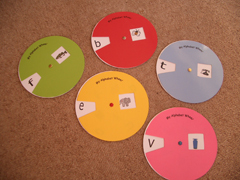 Children turn the wheel to match up an alphabet letter with a picture that begins with the same letter sound. The Tactile Letters are large ‘dashed outline’ lowercase letters of the alphabet to trace or stick things on to make large Tactile Letters. This is especially good for young children who still enjoy playing with manipulatives. Just print on cardstock and stick objects on the letter that begin with the letter sound. For example, for the letter sound /s/ you could decorate with string and sellotape! Alphabet Lotto is a free printable game that’s featured on my very first printables website, BrainEGames. Use your alphabet printables to teach the letters of the alphabet.